This sauce from Mrs Bridges is so sweet and sugary, it’s a bit like eating your roast turkey with a side-order of jam. It does contain whole cranberries, but it just wasn’t saucy enough for our taste panel; it seems there’s no way of making up for the shortcomings of that jammy texture. This sauce somehow manages to be too sweet for some palates and too tart for others. One thing’s for certain, though – once again it’s the slightly too jammy texture that stops this being a really good cranberry sauce. Seems this is the cranberry sauce for people who don’t like cranberries – it’s super sweet and tastes more like strawberry or raspberry. Its texture’s not bad, though, landing somewhere on the scale between a sauce and a jam. Beware those who don’t have a sweet tooth: you may find it all a little too sickly. 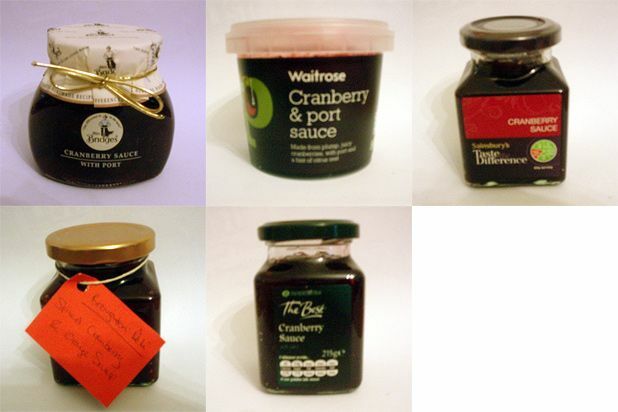 Somehow the clever folk at Broughton Deli have managed to take the taste and smell of Christmas, put it in a jar and sell it to us in the form of this delicious cranberry sauce. This winning formula has the bonus of added cranberries that don’t taste in the least bit synthetic. The substantial texture of this sauce from Morrison’s just about makes up for its insubstantial taste. The chunky bits of cranberry were a hit with our List taste panel, though it’s just a bit too bland to stand out from the crowd.